Riffing madly on well-explored themes, Star Trek Into Darkness sounds like a symphony composed within a single octave, producing a powerful, melodious, and sometimes glorious piece of entertainment, blockbuster-style. After the success of 2009’s Star Trek, which successfully rebooted the franchise, director J.J. Abrams and writers Robert Orci and Alex Kurtzman, joined by producer Damon Lindelof on the screenplay, faced a formidable challenge with the sequel. They’ve elected to pack their second installment with as much whirling chaos and action as possible, interspersed with charged dramatic moments and the type of character banter that provides welcome relief from the relentless pace. And, in a seeming bow to the social topicality espoused by series creator Gene Roddenberry, they’ve knitted political commentary into the fabric of their little space opera. The in medias res opening sequence reveals Captain James T. Kirk (Chris Pine) and Dr. Bones McCoy (Karl Urban) being pursued through an alien forest by apparently hostile native peoples. 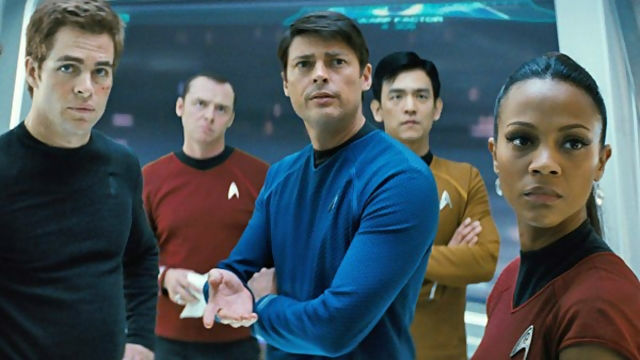 Quickly, Commander Spock (Zachary Quinto) descends into danger from the Starship Enterprise, leaving behind his girlfriend, Lt. Uhura (Zoe Saldana) to worry, and other key members of the crew — Sulu (John Cho), Chekhov (Anton Yelchin), and Scotty (Simon Pegg) — to fret. After that breathless introduction, the crew returns to Earth to get sorted out. They end up on a mission targeting a mysterious figure (Benedict Cumberbatch) who is threatening the United Federation of Planets, led by the iron-willed Admiral Marcus (Peter Weller). Many twists and turns await, both for the characters and the story. Chris Pine impresses with his striking performance. This time out, the role calls for a greater range of emotions, and Pine shoulders his heavy-duty dramatic responsibilities with aplomb. Among the other Enterprise crew members, John Cho stands out; he, too, has been given weightier material to deliver, and he is suitably commanding. Quinto and Saldana measure up to their previous standards of excellence, while Urban, Yelchin, and Pegg are used, more or less, as various degrees of comic relief in support of the lead players. Benedict Cumberbatch, who has already demonstrated a confident ability to sway from one personality trait to another, equally at home with comedy, drama, action, and tragedy, makes for a fierce antagonist, and is absolutely riveting to watch. Likewise, Peter Weller commands the screen whenever he appears, as do Bruce Greenwood, returning as Admiral Pike, and Alice Eve, as a new member of the crew. My only reservations have to do with how things are resolved, which knocks the whole thing down a notch, but overall Star Trek Into Darkness is a very strong, mostly cohesive vehicle that travels very far and very fast into the heart of its characters. Notes on Viewing: Screened at AMC NorthPark, auditorium #9, in 3D. Abrams consiously heightens the 3D effects, often playing with depth of field to enhance the dimensionality. It’s marvelous to behold; this is one of the rare films I’d recommend as worth the upgrade cost to 3D. Star Trek Into Darkness is now playing widely at theaters across the Metroplex.